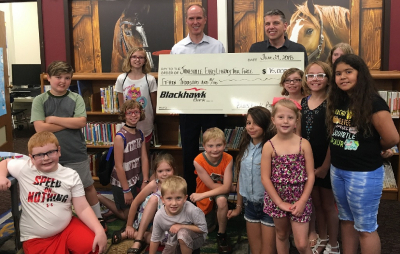 July 12, 2018 (Janesville, WI) – Blackhawk Bank recently announced their commitment to donate $15,000 to the Janesville Early Literacy Task Force over the next three years. These funds will assist the Task Force in providing Janesville youth - from birth to five-years-old - exposure to language and literacy skills, which will increase their ability to read at or above their grade level, once in elementary school. This will be achieved through parent and family outreach, education and mentoring. The Janesville Early Literacy Task Force is committed to engaging the entire community in preparing children from birth to age five to succeed in school and life by empowering families to read, talk, and play together every day.